After I found that out, I checked every products I owned for their ingredients. I am aware that a high level of paraben will only lead to the diseases mentioned but we probably have been using products containing parabens for most of our life and maybe in every single product we use. Scaryy!!! So now I am DETERMINED to use skincare products which does not have any paraben it in. This will includes my body wash, shampoo, lotion, deodorant and etc. Hopefully I can find the alternative. IF my information here is wrong, please let me know. 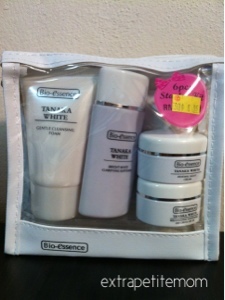 Anyway, I have decided to try Bio Essence Tanaka White series (only their facial wash stilll contain methylparaben which means I still need to find another facial wash). All of the Tri Action Aqua Boost range contain methylparaben. Sadly. The new Bird's Nest facial wash does not contain paraben but it's a whitening. I'm not sure if I want to try it.